In a win for free speech, a federal court in North Dakota recently dismissed a baseless $900 million lawsuit brought by the Dakota Access Pipeline company against Greenpeace and a number of individual protesters. The company should have learned its lesson. Instead, it refiled the case in state court. These meritless cases are textbook examples of “Strategic Lawsuits Against Public Participation,” or SLAPPs. This tactic is increasingly used by corporations to silence critics with expensive legal actions. The pipeline company, Energy Transfer LP, filed the lawsuit in 2017 against Greenpeace organizations and others, including individual Standing Rock protesters. It relied on defamation law and the Racketeering Influenced and Corrupt Organizations (RICO) Act, a federal statute designed to prosecute mob activity. The lawsuit rested on two theories, neither of which passed muster in federal court. First, the complaint argued that Greenpeace and the other defendants were engaged in a conspiracy to defraud the public and defame the company. Second, it claimed that the defendants were engaged in an “illegal Enterprise” targeting the company and should therefore be held liable for any illegal actions committed by those who simply shared a common opposition to the pipeline. 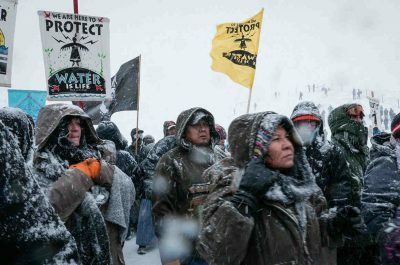 These accusations, wild as they seem, would set a dangerous precedent if accepted: Not only might a different decision bankrupt defendants like Greenpeace — due to both litigation expenses and damages — and destroy the lives of the Standing Rock activists, but it could also erode the right of nonprofit organizations to speak out against corporate actions. Further, acceptance of the company’s legal arguments would make any advocacy group potentially liable for the conduct of its supporters and fellow travelers, even without any evidence of direct coordination. The ACLU, along with a coalition of public interest groups, filed a friend-of-the-court brief in support of Greenpeace and its partners and the individual Standing Rock protesters. We argued that Energy Transfer’s claims violate the First Amendment, which prohibits companies from suing critics out of existence just because their message is anathema to the corporate interests of the plaintiff. We also told the court that the RICO Act can’t be manipulated and exploited to suppress constitutionally protected speech. The opinion chided the company for its hyperbolic complaint and vindicated the activists and organizations that sought to speak out on matters of serious public concern. Last week, in a pigheaded display of its commitment to dragging Greenpeace, its partners, and the Standing Rock protesters through an expensive and unjustified lawsuit for as long as possible, the company refiled the case in state court. This new lawsuit rehashes the same, tired arguments that it presented in federal court, but relies exclusively on state laws. While the federal court ruled in favor of free speech and common sense, and while the re-filed version of the lawsuit is unlikely to succeed, these cases represent an alarming trend in the suppression of public activism. That’s why the ACLU joined a number of other public interest groups in founding the Protect the Protest Task Force, a coalition dedicated to fighting SLAPP cases. These unfounded lawsuits attempt to abuse the judicial system in order to suppress constitutionally protected expression by intimidating activists and advocates. The Protect the Protest Task Force provides support for organizations and individuals targeted as a result of their public interest advocacy. Protesters and advocacy groups have the right to freely and vigorously criticize their opponents, even when their speech threatens to subvert corporate interests. These cases offer a grim reminder of our responsibility to hold companies accountable when they abuse the judicial system with stunt litigation transparently designed to intimidate and bankrupt their critics. Nicola Morrow is Paralegal, ACLU Speech, Privacy, and Technology Project.